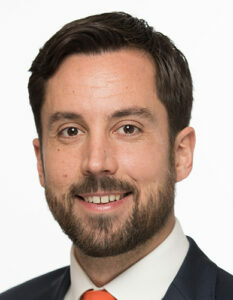 Eoghan Murphy TD was appointed Minister for Housing, Planning & Local Government on 14 June 2017. He previously served as Minister of State for Financial Services, eGovernment and Public Procurement from May 2016. He is the Fine Gael TD for Dublin South East. He was elected to Dáil Éireann in the February 2011 General Election. Eoghan’s priority areas are the high-tech sector and young entrepreneurs/start-ups, reforming Dáil Eireann, and international issues such as nuclear weapon disarmament. Before being elected to Dáil Eireann, Eoghan was a Fine Gael Councillor for the Pembroke-Rathmines ward, elected in June 2009. Prior to entering politics, he worked in international arms control, mostly in the area of nuclear weapon disarmament. He has worked for various organisations including the United Nations; and in cities such as London, Geneva and Vienna. Upon his election to Dublin City Council, he left his job as a speechwriter at the Comprehensive Test Ban Treaty Organisation in Vienna to dedicate himself full-time to politics in Ireland. Eoghan attended Star of the Sea BNS in Sandymount and St. Michael’s College. He studied English and Philosophy (BA) in UCD, and International Relations (MA) in King’s College London, UCL. Outside of politics he enjoys watching rugby, reading and outdoor activities. Minister Eoghan Murphy confirmed today (16 October, 2017) that over the course of the weekend, the Department of Housing, Planning and Local Government, Dublin City Council, the Dublin Regional Homeless Executive and all Local Authorities, have been working with a range of homeless agencies, to ensure that arrangements are in place across the country so that all homeless individuals and rough sleepers have shelter and a safe place to stay during Storm Ophelia. Facebook, Amazon and Yahoo in major office expansion plans.